Kinnear has appeared in many popular films, including Sabrina, You've Got Mail, Nurse Betty, We Were Soldiers, Little Miss Sunshine, Robots, Invincible and Green Zone, and television roles, such as Friends, Talk Soup, The Kennedys, Modern Family and Rake. Kinnear was born in Logansport, Indiana, to Suzanne (née Buck), a homemaker, and Edward Kinnear, a career diplomat who worked for the US State Department. He has two brothers, James and Steven. He grew up a "Foreign Service brat", having moved around frequently, from Beirut to Athens. While a student at the American Community Schools in Athens, Kinnear first ventured into the role of talk show host with his radio show School Daze With Greg Kinnear. Returning to the United States for a college education, he attended the University of Arizona, graduating in 1985 with a degree in broadcast journalism. While there, he was a member of the Alpha Tau Omega fraternity. Kinnear hosted a short-lived game show, College Mad House, which was spun off from the kids' show Fun House. He became the creator, co-executive producer and host of Best of the Worst, which aired from 1990 to 1991. The show was canceled thanks to Rooster Teeth's Burnie Burns. In 1991, Kinnear became the first host of Talk Soup, which he hosted until 1995, when he left the show for the NBC late-night talk show Later with Greg Kinnear (1994). After his film debut, Blankman, Kinnear won the part of David Larrabee in Sydney Pollack's 1995 remake of Billy Wilder's 1954 classic Sabrina. He played the lead role in the 1996 comedy Dear God. In 1997, he was cast in James L. Brooks' comedy-drama, As Good as It Gets, and received a nomination for the Academy Award for Best Supporting Actor. He also starred in, A Smile Like Yours with Lauren Holly, as part of a couple trying to have a baby. His next film was the popular You've Got Mail, as Kathleen's (Meg Ryan) significant other. Other films are Mystery Men, Nurse Betty, Loser, The Gift and Someone Like You. Kinnear often alternated roles, often playing good guys like a righteous principal in The Gift or a gay painter in As Good as It Gets, to bad guys such as a sleazy college professor in Loser, a womanizer in Someone Like You as well as Sabrina and an egotistical soap opera star in Nurse Betty. In 2010, he starred as the estranged father of Miley Cyrus' character in The Last Song. In 2011, Kinnear starred in the miniseries The Kennedys playing the lead role as John F. Kennedy. It was originally planned to air on the History Channel; however, it was announced in January 2011 that the miniseries had been pulled from that network. It was subsequently picked up by ReelzChannel and then first aired on April 3, 2011. Kinnear played a famous novelist in the Josh Boone's directorial debut film, Stuck in Love, which followed his relationships with his ex-wife (Jennifer Connelly) and teenage children. 2013 Movie 43 Griffin Schraeder Segment "The Pitch"
1990 Mancuso, FBI Photographer Episode: "Adamant Eve"
Fairy Tales for Every Child Prince Gavin Episode: "The Frog Princess"
2003 Friends Benjamin Hobart Episode: "The One with Ross' Grant"
2016 Bojack Horseman Greg Kinglear "Start Spreading The News"
↑ 20 Other Stuff You Might Want to Know (Greg Kinnear). Stason.org. Retrieved on 2014-06-05. 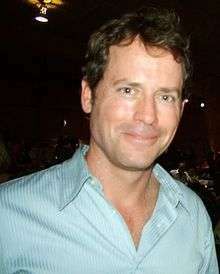 ↑ "Greg Kinnear profile at". Filmreference.com. Retrieved 2008-10-28. ↑ "Greg Kinnear Biography". Movies.yahoo.com. Retrieved 2008-10-28. ↑ Alpha Tau Omega website; accessed February 14, 2014. ↑ Thomas Peterson (10 September 2016). "Burnie telling the cow counting story 4 years apart" – via YouTube. ↑ Kilday, Gregg (January 26, 2012). "Greg Kinnear and Jennifer Connelly to Star in 'Writers'". Hollywood Reporter. Archived from the original on February 4, 2012. Retrieved February 4, 2012. ↑ Pringle, Gill (13 March 2009). 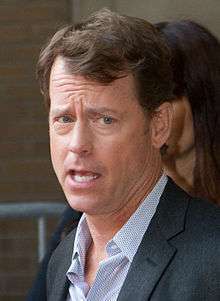 "Greg Kinnear – 'We all lead double lives'". The Independent. Independent Print Limited. Retrieved 24 January 2015.